Owls are one of the hottest decorative trends for 2012. They started popping up this summer as the Go To Halloween costumes, decorations, and ornaments and that trend has only gotten hotter for the Christmas 2012 Holiday Season. You don't have to be a birder to love seeing a beautiful and rich Kurt Adler ornament on your Christmas tree. If you love funky ornaments you won't want to miss some fun Feng Shui ornaments. 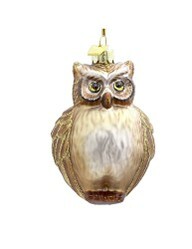 But whatever you choose and owl is the must have 2012 Xmas ornament. Owls are a symbol of wisdom in western cultures - and a symbol of luck in Japan. So it's no surprise that the owl is a familiar element in graduation cakes and decorations, jewelry and yes, even Christmas decorations. Renowned ornament designer Christopher Radko has been on the owl ornament bandwagon for several years and has created many wimsical and wise owl ornaments. If you've got a wife who returned to college after raising a family, who has just earned her degree - add an owl ornament to the family Christmas tree, to show her how proud you are of her. She'll love the Radko White Owl with blue graduation cap perched on a stack of books. You've also got to choose if you want lots of bling on your owl ornament or if you want a more natural owl xmas ornament. I say in the spirit of compromise that you should do both. If you've got a small fir tree in a pot that you decorate on your front porch, it might be fun to decorate it with natural ornaments. As people approach it, maybe you'll fool some of them with a natural ornament.or two. The Radko natural ornaments might have them expecting to hear a hoot or two! Owls with their large oversized eyes have marvelous expressions that will really pop on any Christmas tree. Choose the natural owl ornaments, if you love traditional country decor. They'll coordinate beautifully with popcorn and cranberry strings. If you love natural wooden ornaments then natural birds and pinecones work lovely together. Modern or contemporary decor compliments glass owl ornaments with gemstones and metals. So you can see that there is an owl ornament design that is appropriate for every interior design style. If you've got aunts and uncles that are birdwatchers - and you never know what to give them - bring them a natural owl ornament to keep. But also bring over a few pounds of birdseed for the backyard birds they love to watch! Feng Shui Have a little feng shui fun with your Christmas tree. 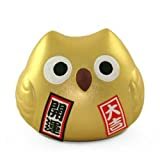 If you place, the Gold owl ornament in the part of the room that faces west, it will bring you good fortune in finance. Here's how it works linguistically. Fuku means fortune in Japanese. It is the first part of fukuro, which means owl in Japanese. Mythology Owls have been around for a long time. There is fossil evidence that shows they've been pretty much unchanged for 60 million years! Don't forget that dinosaurs and birds are closely realated. The first good press the owl got was from the Athena, the Greek Goddess of Wisdom. She used a little owl as her messenger. Half way around the world the Aztecs believed that the owl was the messenger of Mictlantecuhli, "The Lord of the Land of the Dead." In this case the owl's job was to carry messages between the worlds of the living and the dead. The Chinese have a more duplicitous view of owls. A breed of owl known as xiao was fabeled to eat its own mother. Did the Chinese call this owl - Bad Owl? Nooooo. The character xiao is used to characters to denote ferocity and bravery. As I said a mixed message. So put an owl ornament on your Christmas tree, give it as a gift, and tell them an interesting tale. More Christmas Ornaments to Buy! A great selection of Red, White and Blue ornaments for your Christmas tree at affordable prices.